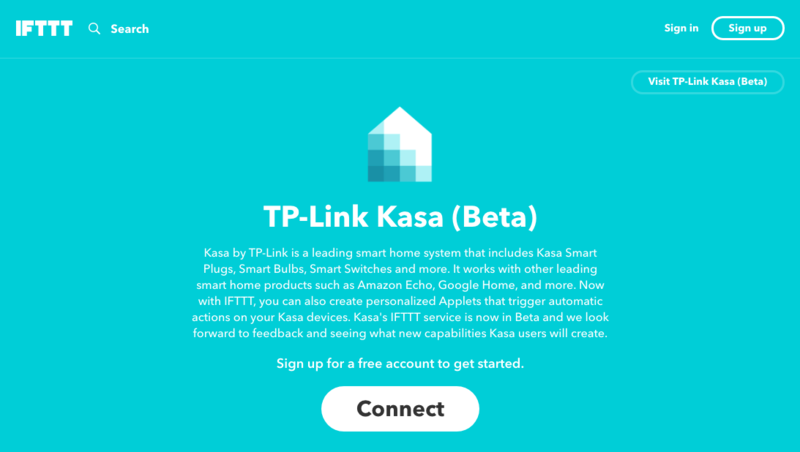 IFTTT is continuing its crusade to bridge your different online services and smart home gadgets and appliances together, with the latest addition being TP-Link's Kasa series of smart bulbs, switches, and plugs (which, I might add, are already Google Home-compatible). The Kasa channel is still marked as "beta" on IFTTT, but there are already plenty of ideas for integrations with motion detectors, smart cams, your phone's location, and so on. For now, the IFTTT channel only offers actions for TP-Link, like turning a Kasa device on, off, toggling its state, changing the color or brightness or color temperature of a bulb, and setting a scene. Unfortunately, your Kasa devices can't be used as triggers, so you can't have music playing when you turn on a lamp for example. And since I already have you here, I thought I'd also mention that Kasa isn't the only channel that's been recently added to IFTTT. There's also Aura Frames, Amarr Entrematic, and Optus Smart Living, 3 services I haven't heard of but that I'm sure some of you will appreciate.